She continued that "there is no such international practice. I don't accept that decision, I reject it and I won't return to Germany." Close to the consulate, a protest of about thousands of Turkish demonstrators continued despite Dutch police used guard dogs and batons to disperse the crowd. On Saturday, Dutch government canceled Turkish foreign minister's flight permit and blocked family minister's convoy from entering the Turkish consulate in Rotterdam. 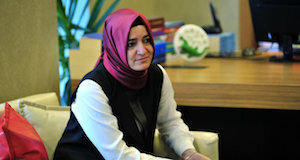 The ministers were due to meet Turkish society ahead of April 16 referendum which will see a constitutional amendment. Turkish foreign ministry asked duty-off Dutch ambassador in Ankara who was on leave not to return 'for a while'. Dutch police dispersed Turkish citizens who took to the streets to protest police's treatment of Turkish family minister. In Turkey, hundreds of people flocked to Dutch missions in Ankara and Istanbul to protest the Dutch government's moves. President Recep Tayyip Erdogan described the move as a measure by "Nazi remnants and fascists"